Womens Very Comfy Fine Sock 2 Pack is rated 3.9 out of 5 by 38. 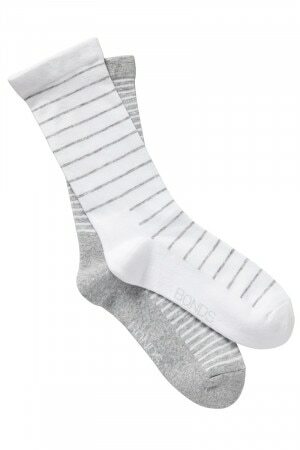 Rated 5 out of 5 by merrily from Bonds Very Comfy Socks (for Men and Women) These are the MOST COMFORTABLE socks I have ever worn. I found them by chance at Big W and have never seen them elsewhere or even advertised. I think the first pair I bought may have been men's as they were Navy with a fine white stripe. They are the only socks I can wear, which don't leave me with swollen feet and are GREAT to wear as Bed Socks!! and look forward to buying more Very Comfy Socks in different colours. Please advertise them, so more people who have a problem with swollen legs and feet, are aware of them. GREAT PRODUCT people and keep up the good work !! Rated 5 out of 5 by MMOM from I bought 10 pairs of these socks because it is not easy to find socks that are not tight around your leg and impede circulation. They are very comfortable with an extra layer on the soles. I liked them so well that I bought some for my husband. Can I suggest that a shorter version would also be welcome. Rated 5 out of 5 by JudyAnneMarg from So comfortable! I love these socks - ultra comfortable, lovely soft cotton, soft wide tops that don’t leave tracks on my shins! And they don’t fall down. I can wear them all day and not give them a thought - the perfect socks. Rated 5 out of 5 by Sandy18 from Well-designed for Comfort These socks are so comfortable to wear that I've bought numerous pairs. Rated 1 out of 5 by Tmmm from Fall down and bunch up The foot part of the sock fits well and is comfy, but then the socks fall down and bunch up. The band around the top is not elasticated, so it's not tight in that sense, but it is tight in the sense that the top of the sock is too skinny. They fall down, bunch up in the shoe uncomfortably, and need to be pulled up and readjusted all day. Rated 2 out of 5 by Romy from I like the fabric and the colour very much but although they are advertised as having a loose fitting top, I find them too tight on the top. I even bought the larger size to try and make sure of this. So in this way, they are not completely comfortable. Rated 3 out of 5 by MikeC from Difficult to distinguish the Mens from the Womens I haven't even worn them yet because I can't tell which pair to wear. I bought mens for myself and a set of womens for my mother. I ripped them out of the packet, threw the packet out and put them through a first wash before use. They are about the same size so it's difficult to distinguish the Mens from the Womens when sorting through the laundry basket. Perhaps some pink threads near the toe for the women would help.